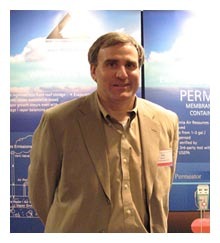 ARID Technologies, Inc., founded in 1993 by Tedmund Tiberi. As a chemical engineer working in the industrial gas industry, Tiberi was involved in separation, storage and handling of a number of liquefied gases and became intrigued by the normal ''boil off'' of cryogenic liquids and the product losses they represent. When engaged in a pilot project utilizing the fledgling membrane separation technology, he struck on the idea of using such a membrane to recover evaporative losses from gasoline station storage tanks. After presenting the idea to his employer and expressing his interest in pursuing the development and commercialization of this new concept, he was met with rejection, but was encouraged to proceed with the idea on his own. With no immediate customers and no working product, Tiberi began in earnest and financed the early developments with his own savings. Bolstered by the vision of creating a product which reduces harmful emissions, saves fuel and creates a healthier environment, he put together a prototype and then a commercial PERMEATOR unit for gasoline stations. He refined the design, adding sensors and remote data acquisition technology to allow continuous monitoring of fuel savings and leak integrity of the fuel station storage tanks and vapor piping. ARID now has installed over 500 PERMEATOR systems in 10 countries. More recently, ARID developed the Membrane CRU for retrofit of carbon adsorption systems at bulk loading terminals. And now, through cooperation with the company Scherzer, ARID is promoting an integrated On-Spot railcar loading and fuel vapor recovery system for railcar loading operations.